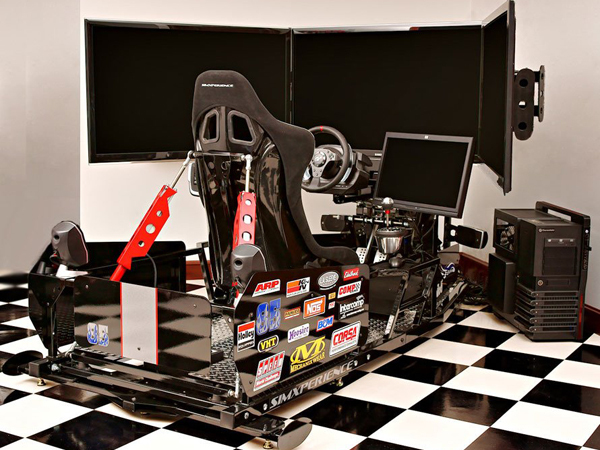 We are proud to offer full motion racing simulators from SimXperience - the premier motion simulator manufacturer with expertise in electronics, engineering, manufacturing and software development. Their products are utilized worldwide in driver training facilities, homes, simulation centers and race driver development programs. Industry Leading Motion Engine Software - Simple enough for home use yet powerful enough for the pros, their Sim Commander 3 motion software is truly the simplest, yet most powerful motion engine available. Exclusive Physics Based Tactile Feedback - The Stage 5 full motion simulator includes SimXperience exclusive SimVibe physics based tactile feedback technology in addition to 3DOF motion. Robust Modular Construction - All SimXperience motion simulators are produced by master craftsman in a state of the art facility and are powder coated to ensure maximum durability and a beautiful finish. Amazing Realism - The Stage 5 provides 250 motion updates per second to ensure that you feel every detail of the vehicle suspension and track. Simulates Rear Traction Loss - SimXperience is the only simulator to accurately simulate rear traction loss, allowing you to drive by the seat of your pants. Excellent Training Tool - From professionals to club racers, the Stage 5 provides a wide variety of training capabilities including laser mapped tracks and advanced analytical tools.